1300 start time on Sunday (Dec 16th) so try to arrive by 1230!! We will start promptly at 1300 this Sunday!! MASH 40 will be our MASH Xmas hash!!! Note: "South" gate should read "North" gate. There are two subway stops close to our place: Shinchon (# 240) on the green line (# 2) and Hongjae (# 314) on the orange line (# 3). -from the Shinchon subway station: take exit # 3, the shuttle stop is to your left at the top of the stairs, take shuttle # 1 past Yonsei University on up Yonhuro Street. When you see Chicago Pizza on your right just after the right turn up to the Seoul Foreign School, push the button to get off. Use the map to walk the remaining way to our place. If you top the hill, you've gone too far. -from the Hongjae subway station: take exit # 3, the shuttle stop is about 60 meters further in the same direction that you exit, take shuttle # 20 or # 21 down the street then right up and over a hill then under an overpass then left under the same overpass again and up a hill and over the other side. As soon as you see the LG station on your left, press the button to get off. Cross the street and use the map to walk the remaining way to our place. -Buses: 8, 59, 73, 522, and 806 pass through Yonhee Dong on Yonhuro street. 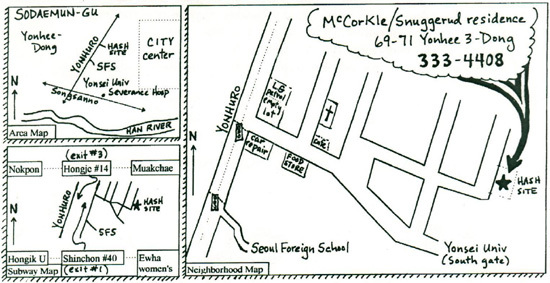 Locate Yonsei University and Seoul Foreign School on a map. Plan on driving through the Kumhwa tunnel around Yonsei and up Yonhuro street past Seoul Foreign School. Use the map to find the rest of the way. Call 011-9703-0026 or 011-777-8196 if you get lost! There will be the usual snacks and drinks afterwards. We will also have traditional Norwegian Glogg to warm you up after the hash, Christmas decorations in our garden, Xmas hashing carols, and everyone is encouraged to dress in holiday colors! There will not a grill, but we hope to organize an empty barrel to have a fire in.